This is a dish my mom makes during the winter because it's so comforting. You can't really go wrong with slow cooked beef and potatoes! Sometimes she'll use cubed beef and add sliced bell peppers and carrots, making it more of a stew. Other times she'll make it as a roast as reflected below. Regardless, the beauty of the dish is the sauce and how it develops a great umami with the balanced sweetness from the tomato sauce and ketchup, along with the saltiness of the soy sauce mixed with the natural juices of slow cooked beef. In a dutch oven set over medium high heat, heat oil. When hot, and garlic and onion, sautéeing until softened. Season roast with garlic powder, salt and pepper. 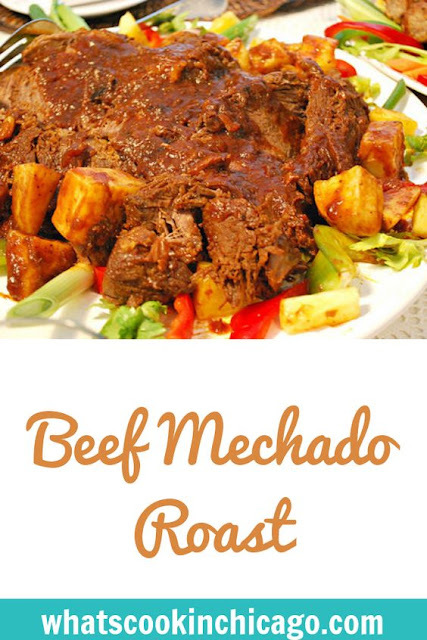 Place seasoned roast in pot and lightly brown all sides. Once browned, add the tomato sauce, ketchup, soy sauce/tamari, bay leaf and potatoes to the pot, stirring to combine. Reduce heat to medium low, cover and cook for 2 hours until roast is tender and has an internal temperature of 160 degrees. Remove roast from pot and set aside, covered with foil. Remove the bay leaf and discard. In the pot now with just the sauce and potatoes, increase the heat and allow sauce to thicken slightly. To serve, slice roast and place on serving platter. 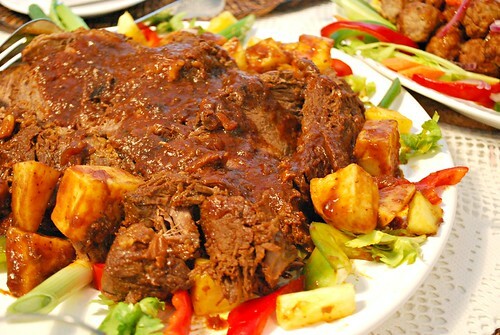 Top with sauce and potatoes and serve with steamed hot rice. You know the old saying 'you should not grocery shop when you are hungry'? I should not look at your blog when I'm hungry! This looks and sounds so delicious! I will put this on my 'to make' list right now. Interesting... I've never done a roast like this before, but I'm going to have to try it! Sound delic! My mouth is filled with water. I love eating these type of food stuff. Thanks for sharing such hot recipe.